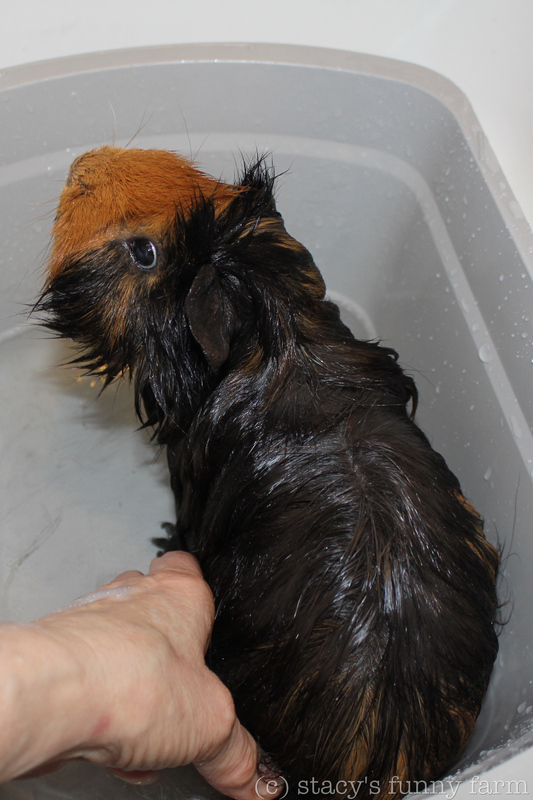 It’s easier and more fun to bathe the guinea pigs when you have a volunteer to help. Still, there is quite a bit of equipment to round up, the kitchen has to be cleared, and you have to have a plan for getting them all wet and then dry efficiently. 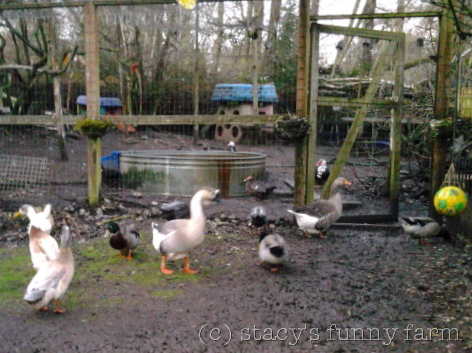 Once you have your ducks in a row (Yes, I have bathed ducks before, too.) Eventually, you take a deep breath, say “Okay!” and dive in. The shampoo and bath part goes fairly quickly. The hair drying takes FOREVER. 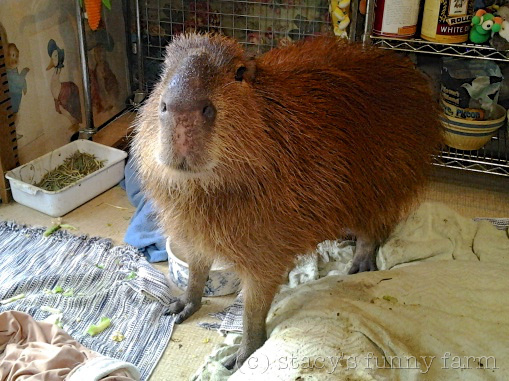 Fred has the shortest fur, so he goes first. 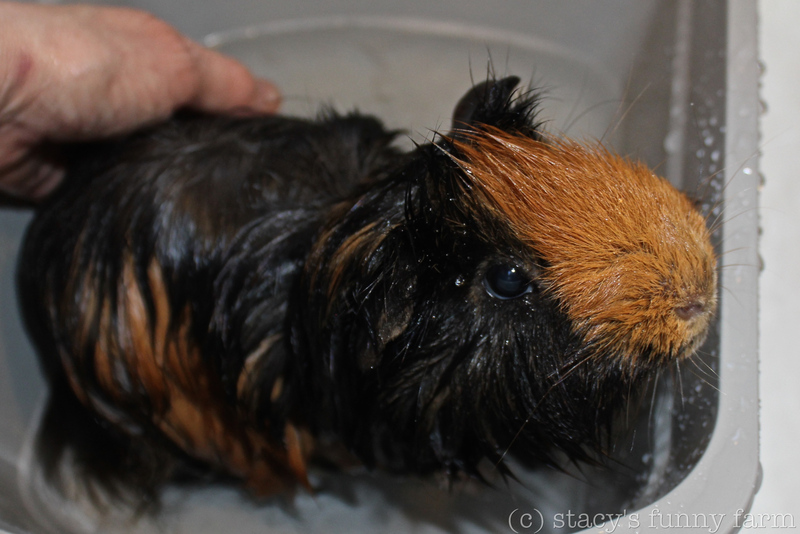 When you are bathing several pigs, it is easy to get ahead of yourself and end up with a bunch of soggy pigs. 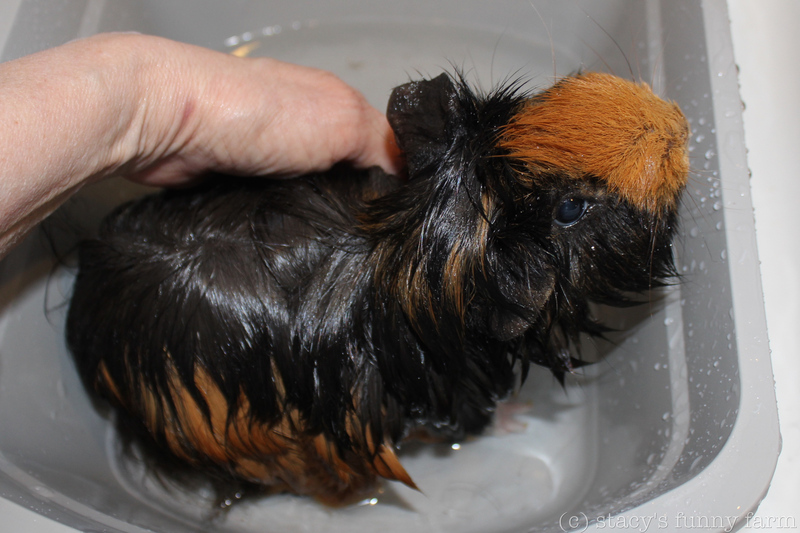 I’ve learned not to bathe the second pig until the first one is dry. 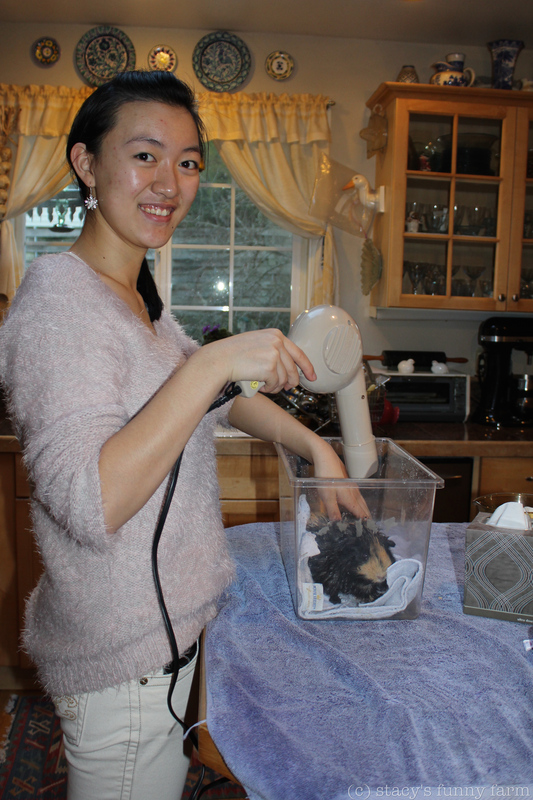 Jillian was on drying detail this time. Meanwhile, #2 pig, Carl Sagan, is sweating bullets. Wait a minute! That’s not sweat and those aren’t bullets! 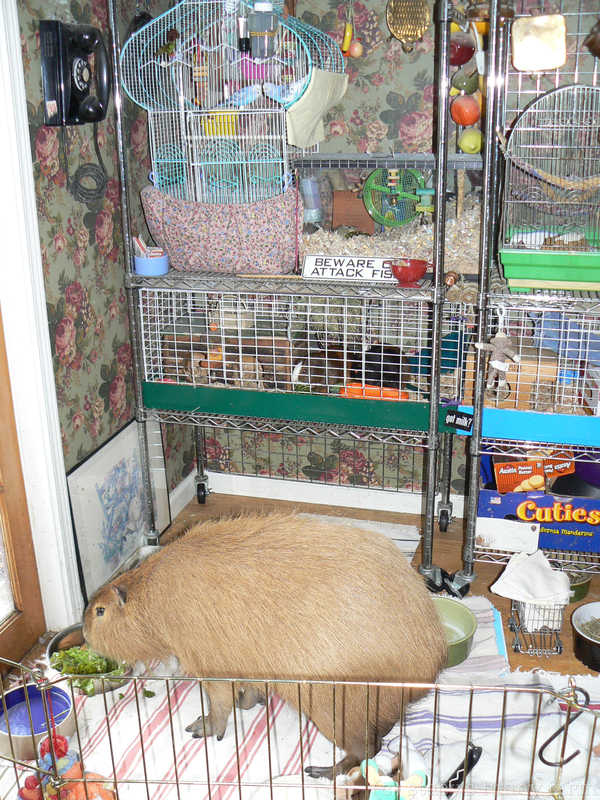 Stevie Ray is such a handful, he’s been asked to wait in the other room. He’s last for a variety of reasons. 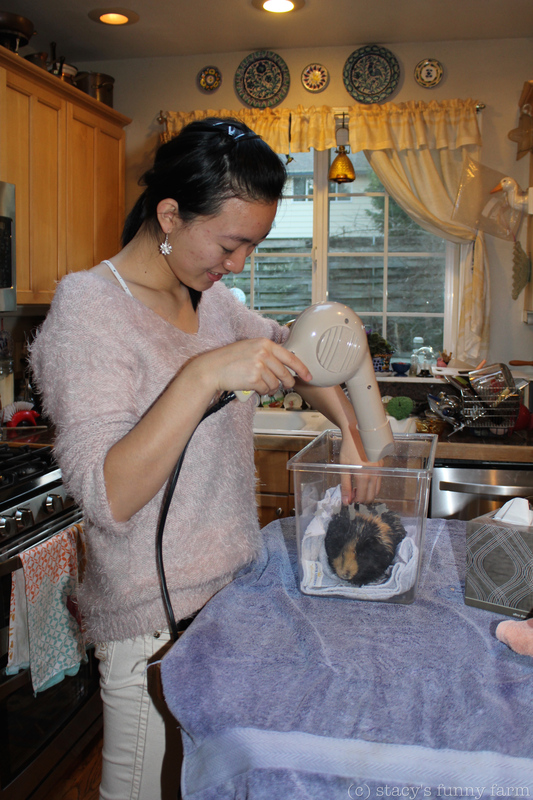 Even short-haired guinea pigs take forever and a day to dry. Little Carl is next. Like the others, he enjoys the warm water until he realizes he is wet, and then he panics a little and tries to jump out. I pour a bit more warm water on and he relaxes. 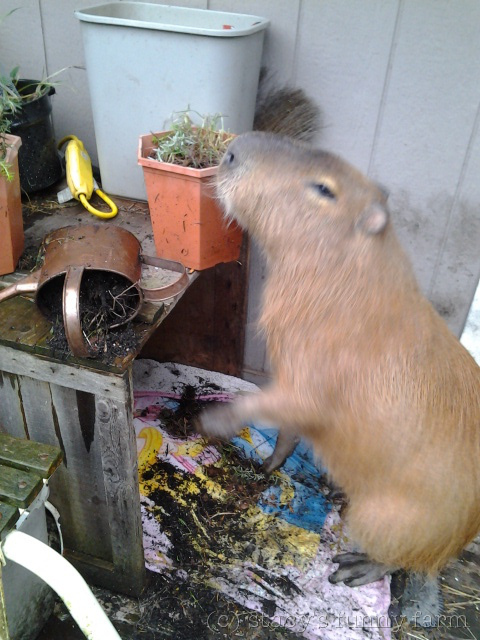 Then he realizes he is wet, and then he panics a little and tries to jump out. 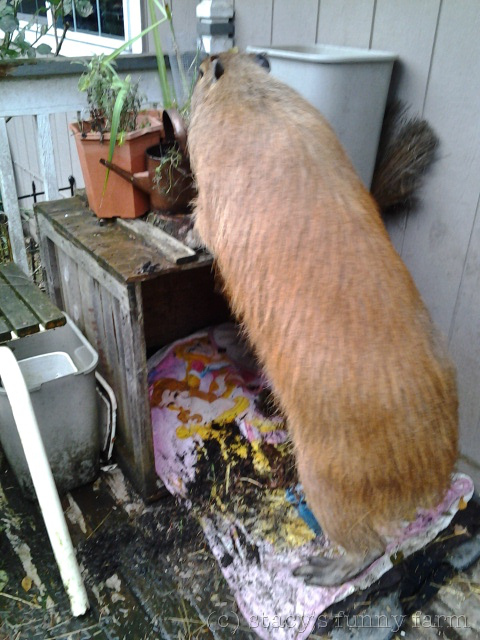 Carl’s fur is a bit longer, so we have to keep fluffing it up to get it dry underneath. They all seem to like the hair drying part. 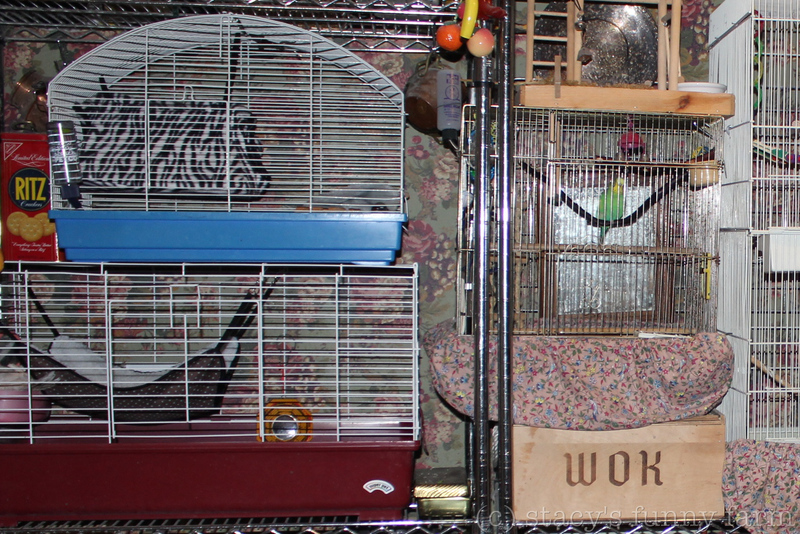 It’s noisy, but it’s warm, and they all want to be the center of attention. Stevie Ray Vaughn has to be last because his fur is so long it takes a couple forevers and then another week to get it dry. 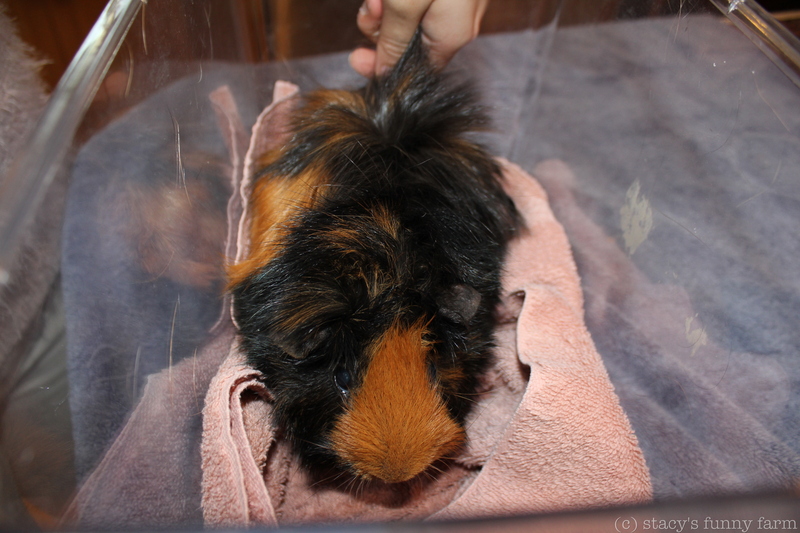 Plus, he’s a snippy little guy with a lot of attitude, and it’s good to practice on the NICE guinea pigs first. 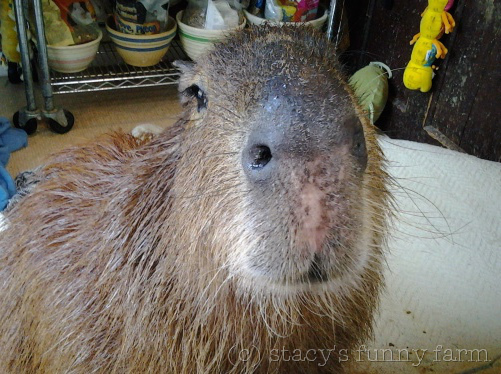 Stevie Ray is such a handful that I was unable to get any photos of him in the tub. Between the shampoo and the voluminous hair slowly expanding to fill the entire tub and the constant bean removal and the frantic jumping from one side to the other, there will probably never be any photos of this guy in the tub. Stevie Ray likes the hair dryer, but it takes a long, long time and he gets bored. After a while he starts horsing around. 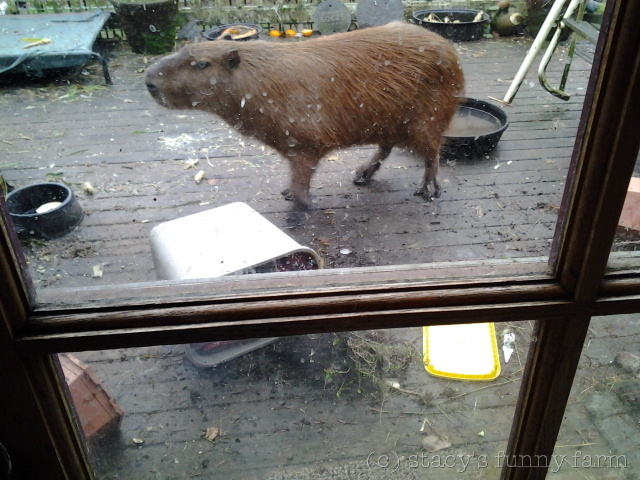 He spins and slashes at us with the toenails on his hind feet, and the beans start flying. He stands up in the drying box- good! We can dry his belly fur! But no, he drops and spins. We get a dry clean towel. I hold him on his back like a baby, the way he loves to be held. 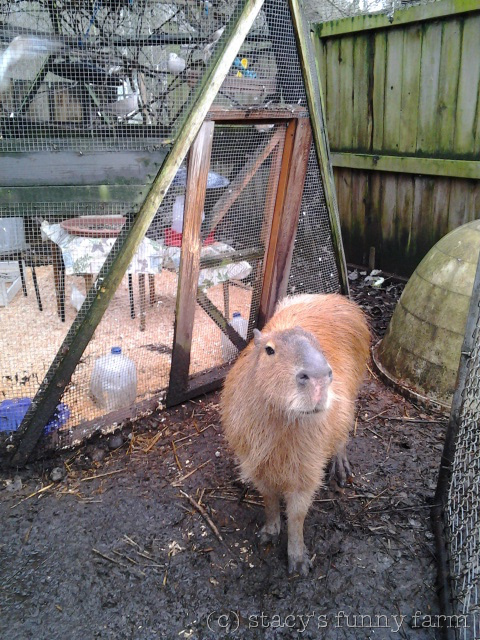 Jillian takes advantage of the new damp exposed areas and he lets us dry him for another minute and a half. He looks good in the photos, though. We take a break, but all-in-all it probably takes over half an hour to dry this turkey. We’re wet, now. The kitchen is wet. 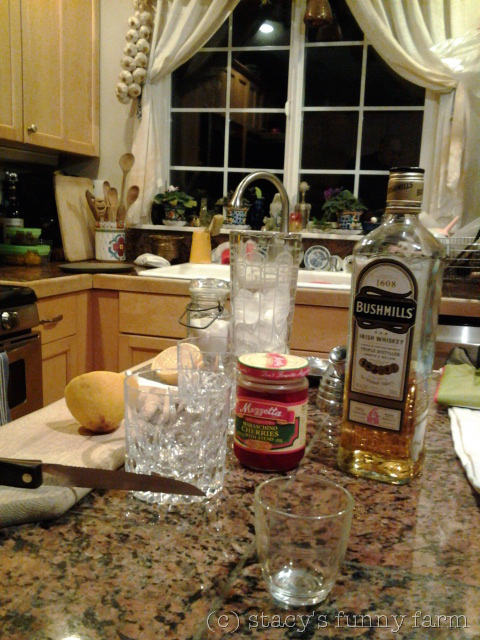 I’m thinking ahead to dinner, maybe we’ll go out. Meanwhile, back at the Dude Ranch, snacks are served. I wonder if they have noticed that they smell like raspberry shampoo. 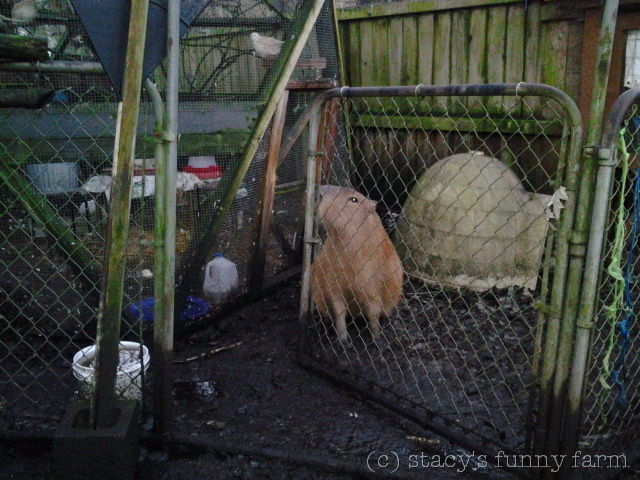 Winter at The Funny Farm can be pretty grim. Water dishes have to be unfrozen daily, and the huge ice cubes that were yesterday’s water have to be stashed out of the way so they don’t become tomorrow’s hazard. I can get everything thawed and functional with only two gallons of hot water, but so far I haven’t had to bring out hot water just to open a gate. That adds to the drama, for sure. 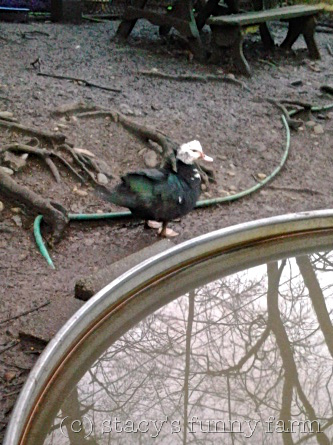 Winky the muscovy duck pulled a fast one on the coldest night- we had two nights below 20°f. Afternoons are spent ruining the remaining grass in the back yard and chasing the wild mallards away from the cracked corn dish in the back yard. 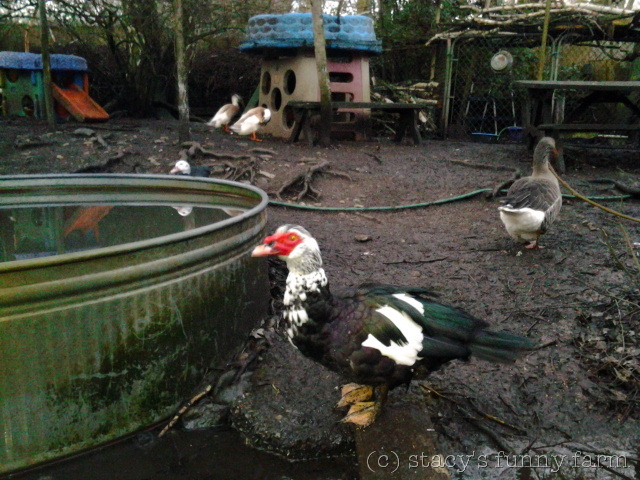 At dusk, Norman the Goose rounds everyone up and they return to the aviary to roost.If anyone dawdles, it is Winky, so if she is settled in for the night, the rest are sure to be in. 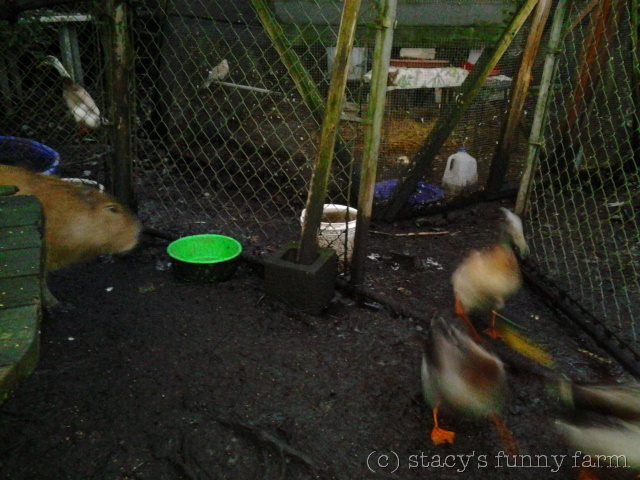 That night, the ducks were in but I noticed they were settled into an unusual area in the aviary. I couldn’t find Winky anywhere: brown duck on brown ground, brown leaves everywhere. Not finding her was disconcerting, but where could she be? 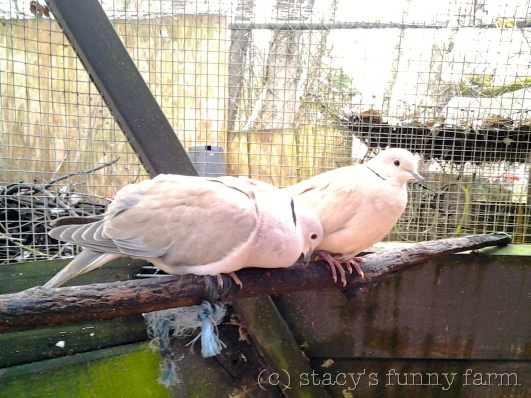 Morning held the answer: on TOP of the aviary! 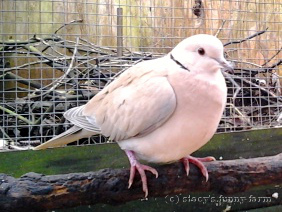 She had flown up and was perched on a net support! A candidate for the Darwin Club, for sure, as the raccoons can be vicious. She stayed up for hours only coming down when the others came into the yard for afternoon destruction derby. Time to do a little wing-clipping! 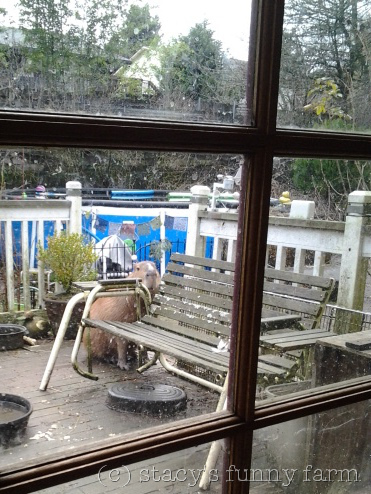 Dobby had declined to graze in the front yard for days. His feet get cold and he holds up his paws, one at a time when they get cold. 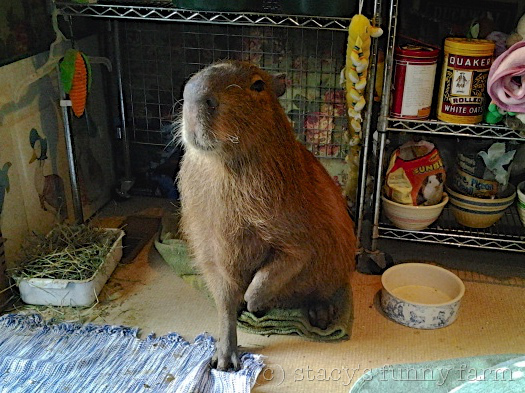 In the photo above, I had just asked him if he wanted to go to the front yard to eat grass and bamboo. He looked at me and held his paw up! Pouffy for all the right reasons. 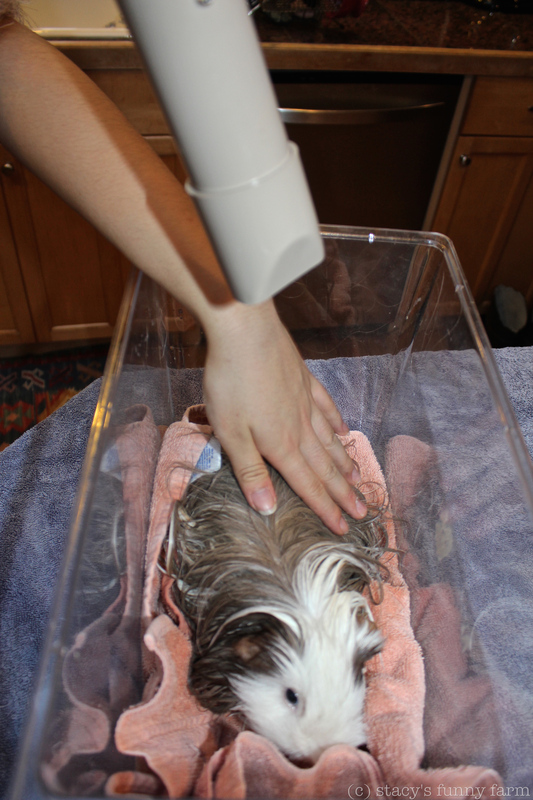 In the photo above, he is a little pouffy because I had just filled his little hot tub and poured nice warm water all over him. 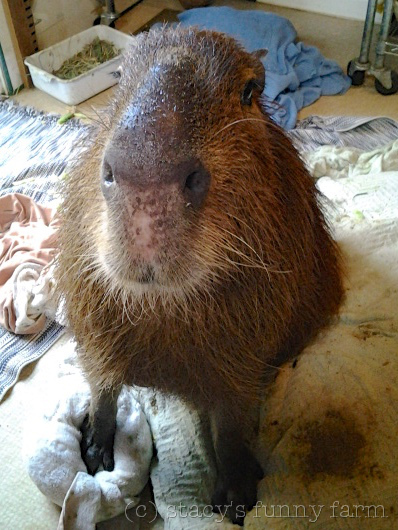 In the winter when it is cold, it is tempting to keep him warm and dry, but capybaras can get skin problems if they don’t bathe. So his slave girl gives him a little bath. 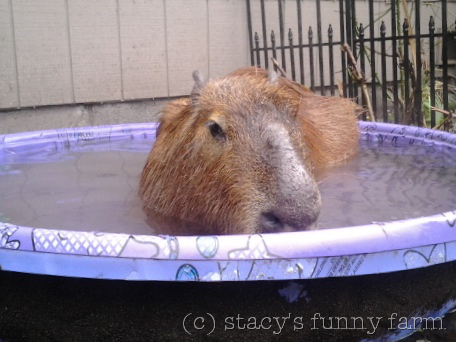 Capybaras are cecotrophic. 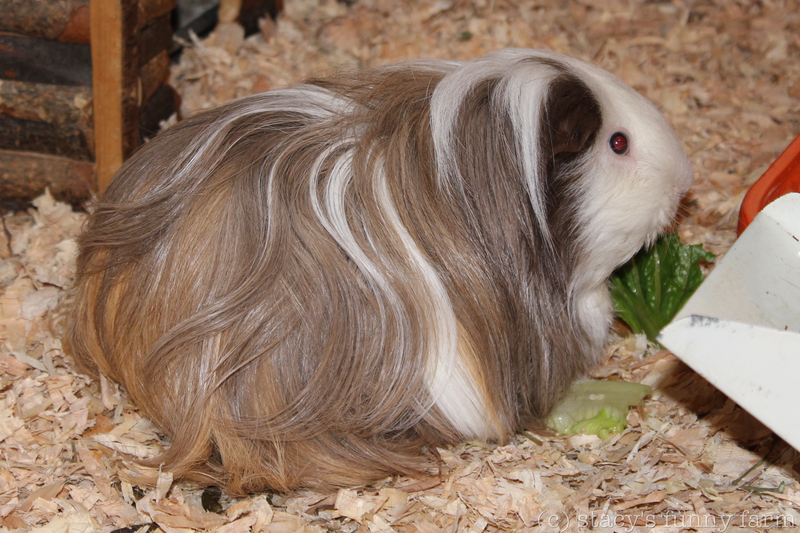 Like rabbits and guinea pigs, they need to eat their poop to obtain more nutrients from their food. That’s a “gravy stain” on his bed, stage left of his driver’s side front foot. 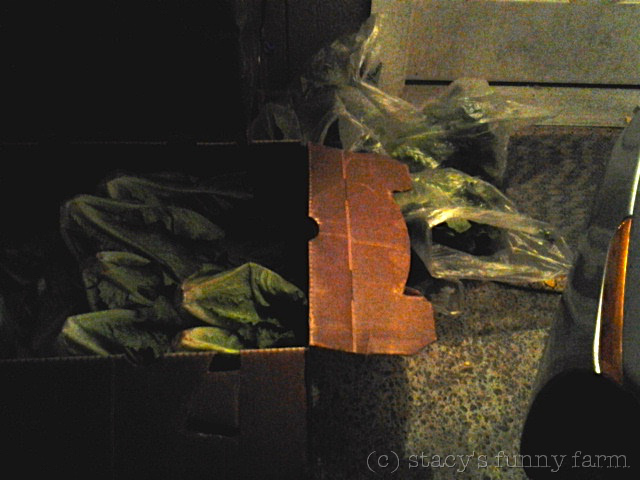 24 heads of romaine lettuce in a box, almost 2 weeks worth. I’m constantly refilling the refrigerator with animal food. 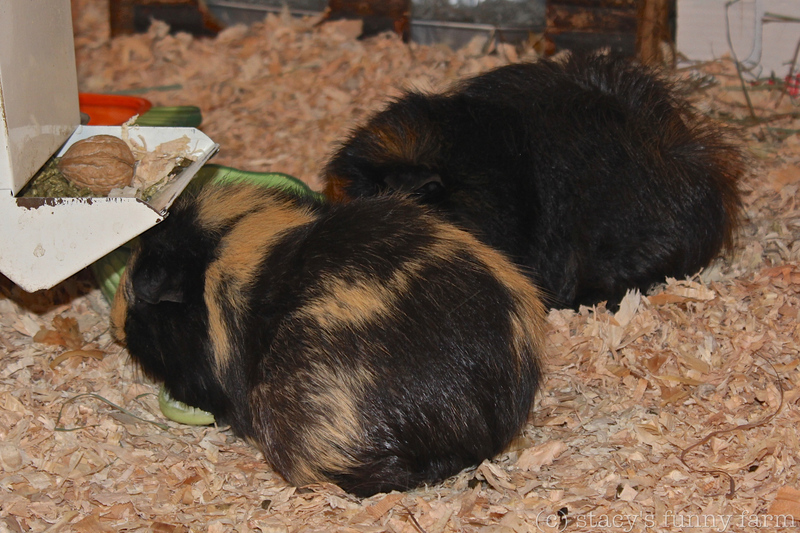 In winter, I have to stash the lettuce quickly before it freezes! This lettuce is in the carport, right outside the door. I bag up each head and cram gently load it into the refrigerator. 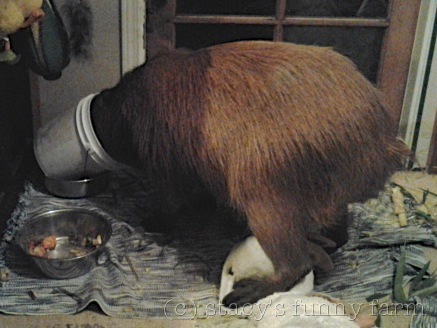 When Dobby doesn’t go to the front yard to graze, he orders take-out. 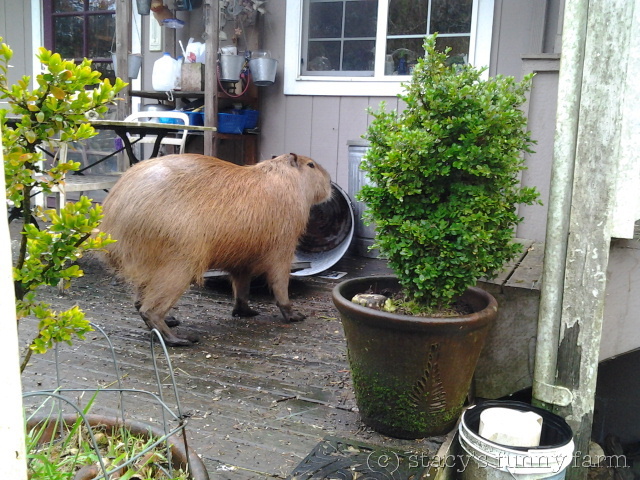 This is a bucket of bamboo, and he is working to get every leaf! 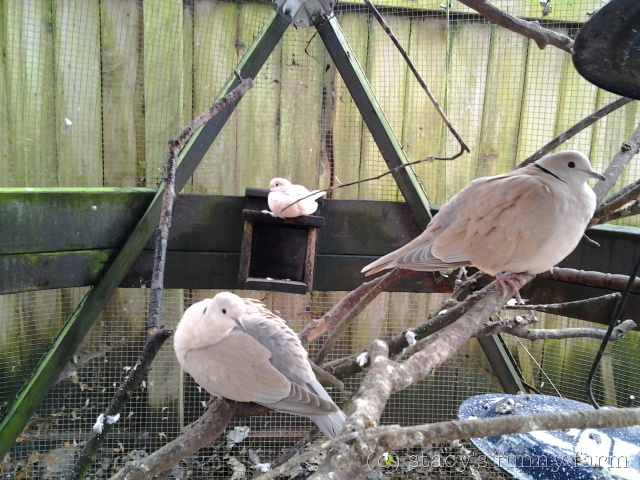 Lots of activity at the bird feeders, now that the weather has softened. 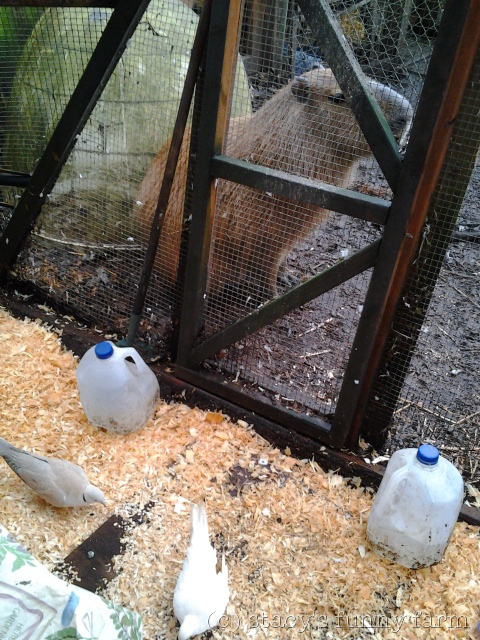 Mallards on the roof, pushy squirrels at my feet, and hummingbirds waiting for me to get away from their food. 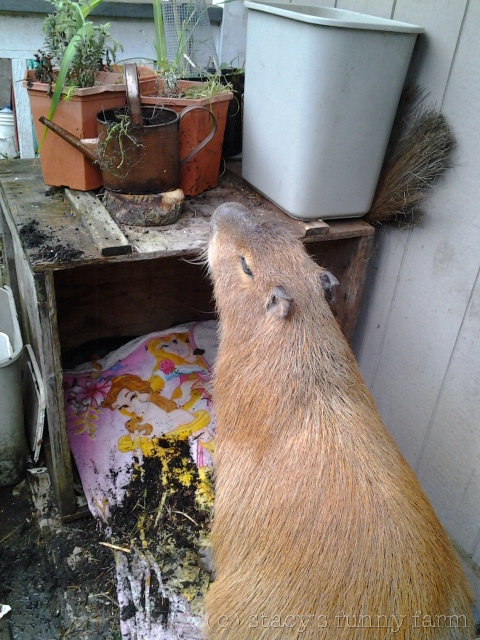 Ever wonder what to do with all that capybara poop when the outdoor toilet is frozen? That’s right, it piles up in a bucket. It must be completely thawed before you attempt to flush it or it clogs the toilet. That’s probably all you want to hear about that! These plants have been outside the kitchen door for weeks, but Dobby decided to rearrange them today. He knocked down that gray plastic garbage can too.